When traveling, the most important item you must carry is your passport. Stolen passports are in high demand, and can be sold for a lot of money on the black market. 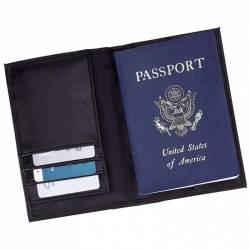 It makes sense to protect your passport with the Embassy(TM) Solid Genuine Leather Passport Cover. A passport cover will protect your passport and extend its life. If you're traveling in areas that have inclement weather, that's all the more reason to protect it. A Passport holder is easily identifiable. 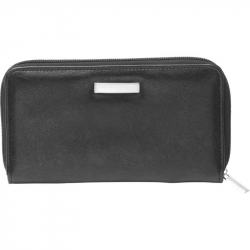 If you have a full bag or purse you can always find your passport easily by the look and style of the holder. If you're traveling in a group, quite often you have to surrender your passport during group tours. It's very easy to identify your passport among everyone else's when it's in a proper passport holder. Features genuine leather exterior and extra-durable faux leather interior. Space for passport, credit cards and driver's license. Measures 3-5/8' x 5-1/2' x 1/4'. 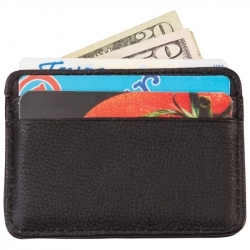 The Embassy(TM) Men's Solid Genuine Leather Tri-Fold Wallet features genuine leather exterior, and has plenty of space for credit cards and your license or ID cards. Pocket for cash bills. Fits easily into a front or back pocket. Measures 4' x 3-1/4' x 5/8'. Gift boxed. 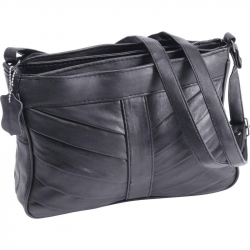 Features faux leather exterior; multiple slots for currency and credit cards; exterior snap closure compartment; and zippered exterior compartment. Measures 6-3/4' x 3-1/2' x 1/2'. 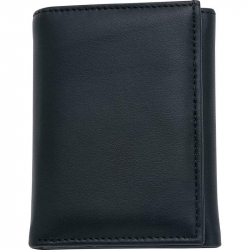 Features genuine lambskin leather exterior; multiple slots for currency and cards; multiple interior compartments; zippered interior compartment; and exterior pocket. Measures 7-1/4' x 3-1/2' x 3/4'. Features gunmetal hardware, zippered main compartment, 2 exterior zippered pockets, interior zippered pocket, and an adjustable shoulder strap. Measures 11' x 8' x 3'. Features rebel flag design on front, leather exterior, heavy removable chain with belt loop, and two silver snaps for closure. Measures 7-3/4' x 3-3/4' x 3/4'. 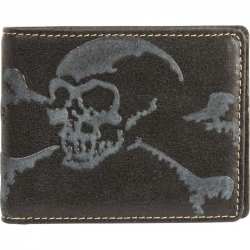 Features embossed skull design; window slot for license; and space for credit cards and bills. Measures 4' x 3-1/2' x 3/4'. Gift boxed. 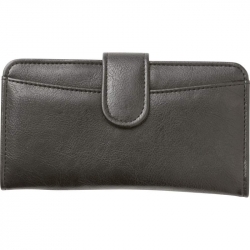 Embassy(TM) Men's Solid Genuine Leather Front Pocket Wallet features money clip, and genuine leather exterior and interior. Fits easily into your front pocket. Space for credit cards and license. Measures 2-3/4" x 3-3/4". Gift boxed. 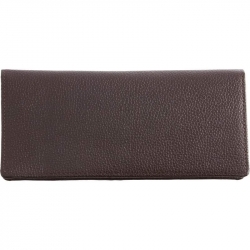 If your fashion sense tends to drift toward the tough side, you'll enjoy this spacious and secure wallet. 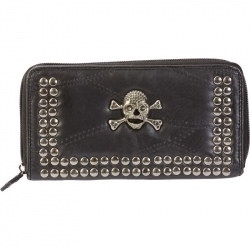 It features a front with skull and crossbones medallion and 70 rivets all in gunmetal finish; zippered main compartment; 1 zippered interior compartment flanked by 4 sections and 12 slots for credit cards. Matching leather zipper pull. Fabric lining. Measures 7-3/4" x 4-1/8" x 3/4". 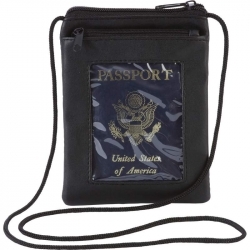 For the well-organized international traveler, this passport cover features a zippered pocket with window for holding passport, a second zippered pocket for holding phone or valuables, and a 36" neck strap for attaching to inside of passport cover. Measures 6-1/2" x 4-3/4" x 1/4". 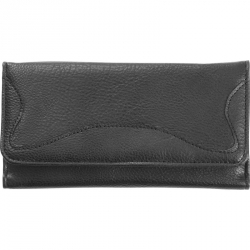 Embassy(TM) Ladies ' Wallet features faux leather exterior; multiple slots for currency and credit cards; exterior snap closure compartment; and zippered exterior compartment. Measures 6-3/4" x 3-1/2" x 1/2". Features zippered main compartment, fabric lining, 1 zippered interior compartment flanked by 4 sections, and 8 slots for credit cards. Measures 8' x 4-1/2' x 3/4'. 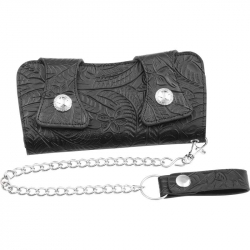 Features embossed tool design with double snap star closure; interior zippered pocket; and space for credit cards and bills. Measures 7-1/2' x 3/4'. 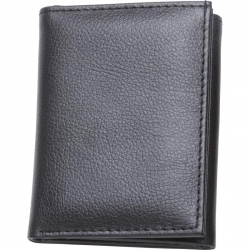 Features tri-fold, button snap closure; multiple interior slots for credit cards and currency; and clear window for ID. Measures 7-1/4' x 3-1/2' x 1/2'. 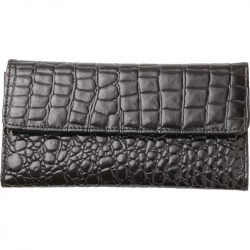 Features faux alligator embossed exterior; interior snap closure compartment; clear window for I.D. ; and multiple slots for currency and credit cards. Measures 7-1/2' x 4' x 5/8'. 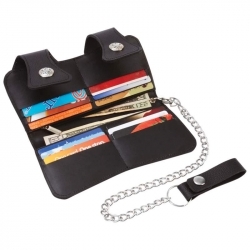 Casual Outfitters(TM) Solid Genuine Leather Double Snap Biker/Trucker Wallet features star snaps and heavy chain with leather belt clip. Measures 7-1/2" x 4". 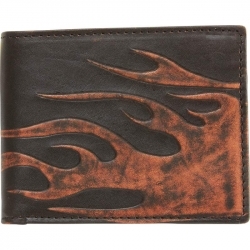 Features embossed flame design; window slot for license; and space for credit cards and bills. Measures 4-1/2' x 3-1/4' x 3/4'. Gift boxed. 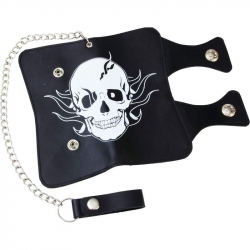 Features star snaps, skull design, and heavy chain with leather belt clip. Measures 7-1/2' x 4'. Features divided space for currency and 6 slots for cards with transparent driver's license window. Fits easily into your front or back pocket. Measures 3-1/4' x 4-1/4' x 1/2'. Gift boxed.